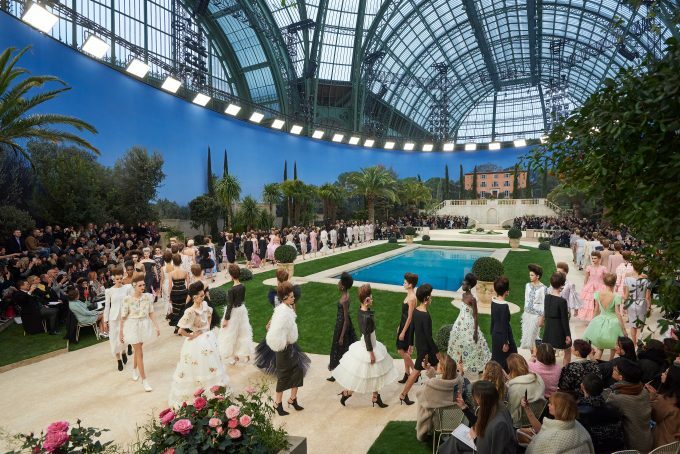 Chanel Couture Paris. 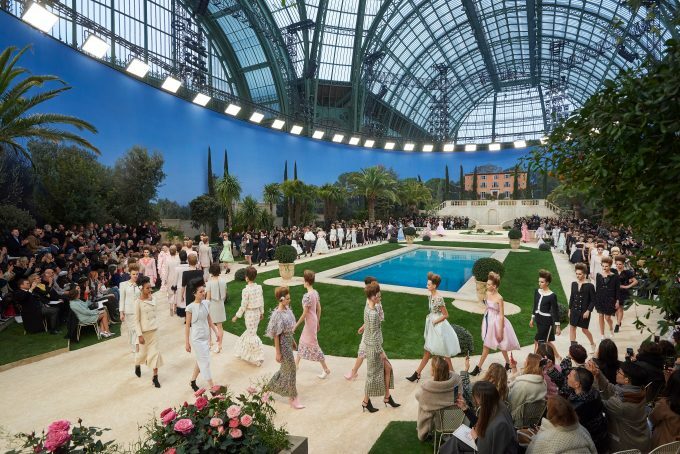 Karl Lagerfeld transforms the Grand Palais into a Mediterranean garden to present the Spring-Summer 2019 silhouettes. This season, the Grand Palais becomes the vast Mediterranean garden of a beautiful, big house. A pool of water is surrounded by trees and Southern plant species in a harmony of neat lines. Pathways are almost “à la française”, like 18th century gardens. 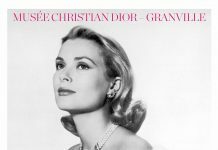 Indeed, it’s this period, his favourite, that has inspired Karl Lagerfeld, and in particular the talents of the marchands-merciers and the savoir-faire of the artisans of French luxury. Among the artistic themes of that century, flowers play an important role. Now, they are at the heart of CHANEL’s Spring-Summer 2019 Haute Couture collection, embroidered, painted, in lace, in feathers, in resin and also in ceramic, they appear even as hair jewels. They explode in bouquets of pastel pink, prairie green and sky blue, and in games of black, white, beige, navy blue, iridescent gold and silver. 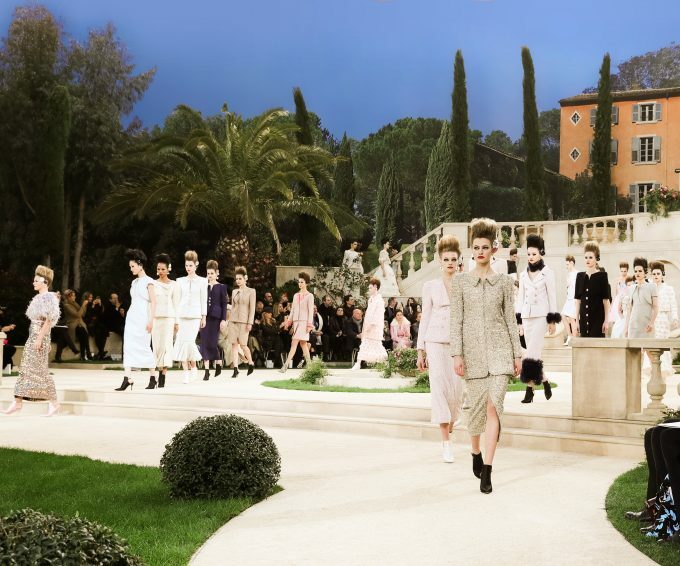 “It’s a serene, ideal, timeless collection, that’s absolutely now, with new shapes”, says Karl Lagerfeld. The dresses and the suits are very refined. On shouldered jackets with boat necklines and on the zip-up skirts that fall to mid-calf, or wraparound skirts cut to the knee, the braid quite literally melts into the fabric: embroidered into the tweed, the lamé wool or the grain de poudre, it further amplifies the pure line of what Karl Lagerfeld is calling “the new CHANEL“. 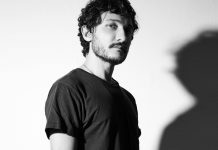 Certain jackets are lengthened like tunics, while others with no collar but a folded lapel, geometric or asymmetric, adopt a double row of buttons. Some, belted high, are extended from a peplum or, conversely, shortened like spencer jackets or aged leather jackets, occasionally warmed with feathers. In tune with the frivolity of 18th century style, the “lingerie” dresses in white pleated chiffon are interspersed with ennobled lace, ruffles and ladder lace. A dress in pleated chiffon slit with entre-deux lace is worn with a very structured leather jacket, for a contrasting and ultra-graphic silhouette. On the same principle a sequinned tweed skirt is coupled with a little cape covered with feathers and fastened at the neck with a leather bow. on these dresses, every horizontal blind tuck is completed by hand, taking up to 350 hours of work. On one organza dress embroidered with flowers made from feathers, the organ pleats that animate the ruffles are gathered thread by thread. The smocked lozenges of a silk blouse are sewn by hand and held in place by 650 beads. A black leather dress cut in spirals is aerated by ladder lace. An entirely sequinned white suit embroidered with patterns inspired by the porcelain of the Manufacture de Vincennes is a veritable work of art. An organza dress with a bolero effect is embroidered with real flowers immortalised in resin. Finally, a long green sequinned dress is embroidered with hand-painted ceramic flowers.